Alaska's Apollo 11 lunar sample display with five tiny moon rocks was recently recovered after having gone missing for 40 years. "The Last Frontier" has been reunited with the "final frontier" after the return of moon rocks that went missing in Alaska nearly 40 years ago. The tale of the tiny lunar pebbles' restoration to the 49th state includes an arson's fire, a teenager's theft, a science fair photo and a ship's captain from a reality TV show. Last Thursday (Dec. 6), Alaska's State Museum in Juneau debuted an exhibit of the five recently-returned fragments of the moon, which in 1969 were encased together in a lucite sphere and mounted to a wooden podium for presentation to Alaska by then-President Richard Nixon. 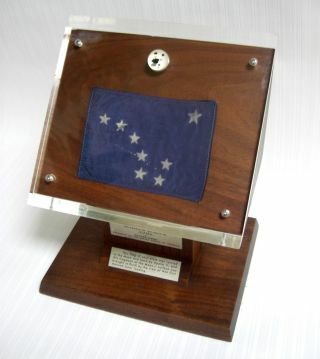 The gift, which also included a small Alaskan state flag that was flown to the moon with Apollo 11 astronauts Neil Armstrong, Buzz Aldrin and Michael Collins on the first manned moon landing mission, was one of approximately 185 such displays that were presented to the states, the United States' territories and to foreign nations. Similar "goodwill moon rocks" from the final lunar landing, Apollo 17, which flew 40 years ago this month, were also gifted. Alaska's Apollo 17 display is also in the custody of the state museum. "The Apollo 17 rock was not lost or misplaced ... because between the first landing mission on Apollo 11 and the last on Apollo 17, something happened in Alaska," assistant U.S. attorney James Barkeley told collectSPACE.com in a telephone interview. "And that was a fire, arson, at the museum that housed the Apollo 11 rocks in Anchorage." Soon after the rocks were presented by President Nixon and before they landed in a museum, Alaska's Apollo 11 lunar sample display went on a tour of the still-young state. One of the stops was for a science fair in the small town of Glenn Allen, a layover that would later become pivotal to reclaiming the moon rocks. "The place is so remote that the moon rocks were housed overnight — guarded by the National Guard — in a house called 'Atlasta,' because there were so few houses along the road that when people arrived there, they would say, 'At last, a house!'" Barkeley commented. It was there in February 1970 that Marie White and her brother, who lived at the Atlasta House, had the chance to hold and have their photograph taken with the moon rock display. The shot captured the smiling children and a clear view of the lunar samples. Many more children had the opportunity to see the same rocks after they arrived at the Transportation Museum in Anchorage, a small aviation museum that was curated by Phil Redden. That is, until a fire tore through the facility in 1973. "There was a fire of suspicious origin, later determined to be an accelerant," Barkeley said. Everything in the museum was destroyed, everything but the moon rocks. "A couple of museum employees at the time saw them, intact, inside a glass display case in the aftermath of the fire," Barkeley said. "They were just missing after the fire damage was cleared out." "Mr. Reddin had a ne'er-do-well stepson named Coleman Anderson, who would grow up to become a skipper who was seen on the first season of the [Discovery Channel's] 'Deadliest Catch' reality show," Barkeley said. Anderson, who was 17 at the time of the fire, went to the museum to help his stepfather clean up the fire's debris. He later said he left the museum that day with the moon rock display, which he claimed he retrieved from among the rubble. Other museum staff reported seeing Reddin remove the moon rocks to take them home for safekeeping. "No one knew what happened to [the moon rocks] for approximately 40 years until Coleman Anderson surfaced through an attorney in Seattle," Barkeley said. "And they had the cheek — I'll use the upper part of the anatomy instead of the lower part of the anatomy, but the same sentiment — to file a lawsuit in the state court seeking to quiet title, that is to claim best ownership [of the display] as against the entire world." "Coleman told a yarn about how he had picked up these moon rocks in pieces and they were horribly disfigured. The flag of Alaska that was flown to the moon and back had been shriveled up. The base was detached from the rest of the plaque. There had been some melting and some other physical damage," Barkeley recounted. "He was kind enough, he stated in his complaint some 40 years later, to have polished it with a toothbrush and to have otherwise taken very good care of it, restoring it to, apparently, almost intact condition." As legal proceedings began, Anderson indicated that the moon rocks were somewhere overseas, where they were out of anyone's reach. The only way to get them back, he said, would be to pay him. "He was willing to give the state of Alaska a discount," Barkeley said. Alaska assistant attorney general Neil Slotnick, who was leading the case for the state, argued that without being able to authenticate the moon rocks, the state couldn't be expected to deal with Anderson. "It was kind of like a dope deal — you know, who is going to pay good money for something if not the real stuff?" Barkeley remarked. "Well, we said, who can authenticate moon rocks? Oh yeah, NASA!" Complying with a court order, Anderson turned over the rocks for testing and authentication at NASA's Johnson Space Center in Houston. But Barkeley, whose master's degree is in volcanology, knew something that Anderson did not. "I knew that testing using a comparison of the chips that we have to the remaining treasure trove of Apollo 11 rocks at the Johnson Space Center would be destructive of our chips," the assistant U.S. attorney said. Barkeley also knew that the FBI had become "extremely good" at using photographs to authenticate objects. And he had just such a photo to use: the picture taken of Marie White at the Atlasta House. "[The FBI] was gracious enough to do a photographic comparison between the old photograph taken in February 1970 as one that depicted the rocks in their almost mint condition as it had just been presented just a couple of months earlier by President Nixon, and the photographs taken at Johnson Space Center in 2012 of the rocks as turned over by Coleman Anderson," Barkeley said. "They were comparing, much like you would fingerprints, for points of similarity or the opposite thereof. They looked at, for example, the five rock chips and all of their relative spacing between them, little angles on the rocks and then for the macro comparisons, such as the position of the lucite to the wooden base," Barkeley added. "Their expert opinion after many comparisons was, without a doubt, this is the same object." It was shortly thereafter that Anderson was persuaded to surrender the moon rocks. "[The FBI] conclusively showed what Coleman Anderson had testified under oath at his deposition was dubious, at best," explained Barkeley. "To say that the plaque, taken apart or rendered into pieces, the flag partially melted and the other damage as described was then, somehow, so precisely reassembled that none of that physical damage was apparent and that the relative positioning of all the objects that made the plaque were identical, defied logic." Alaska's Apollo 11 lunar sample display will be on exhibit at the State Museum throughout the month. The rocks will then be removed from display so that the plaque they are mounted to can be restored, the Alaska Dispatch website reported. A virtual display of the moon rocks will likely be available on the museum's website, the Dispatch added. With the return of the Apollo 11 samples, both of Alaska's goodwill moon rock gifts are now being properly cared for in the custody of the state. Of the Apollo 11 samples that were gifted to the 50 states, 11 are known to be missing, including the lunar pebbles presented to Massachusetts, New York and Texas. Eight of the states' Apollo 17 moon rocks have yet to be found, including those in Kansas, New Jersey and Ohio. Worldwide, of the 270 lunar samples that were gifted to foreign nations, more than 180 of the moon rock displays remain unaccounted for despite a now decade-long private search conducted by graduate students, the public and by the readers of collectSPACE.com. See collectSPACE.com for the "field guides" to missing moon rocks: Where Today are the Apollo 11 Lunar Sample Displays? and Where Today are the Apollo 17 Goodwill Moon Rocks?